Would you like to be in the position of authorising content before it goes live to your organisations website? BeeCOS has developed a market leading "secure page and content approval system" called Business Content Approval Manager. This module enables multiple authors to contribute to your company's website and for all content to be approved before it is made available online. 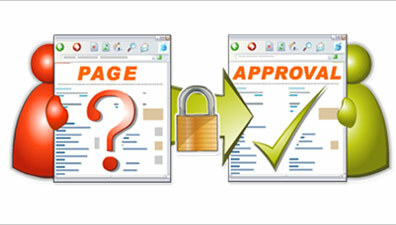 In short, prevent the release of unauthorised content until it has been properly approved. This module dramatically improves the efficiency of content approval and journalist management - saving time and cutting costs. Would you benefit from multiple individuals writing, collaborating and contributing to your company's website, intranet or extranet? Would you like to establish organisation wide e-newsletters? Or perhaps deliver a collaboratively produced business partners e-newsletter? Would you benefit from receiving content authored by a wider community of contributors? Are you out of time when it comes to keeping your website up to date? Business Content Approval Manager is one of the easiest ways to achieve peace of mind with regards to your website and electronic communication strategies. 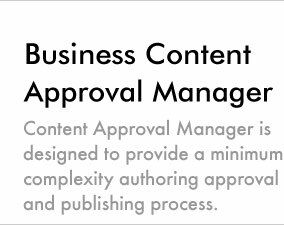 Business Content Approval Manager provides a minimum complexity authoring and publishing process. It enables businesses and organisations to manage approval and content verification for a community of authors and journalists numbering in the hundreds and potentially thousands. With Business Content Approval Manager, it is possible to invite authors and editors to contribute or approve content from anywhere in Australia or the world and creates new opportunities for collaboration and innovation within business. Business Content Approval Manager dramatically improves the efficiency of content approval and journalist management - saving time and cutting costs. This module dramatically improves the efficiency of content approval and journalist management - saving time and cutting costs.